As markets continue to suffer and oil reaches new lows, why is gold shining brighter than most other commodities? When it’s all said and done, what exactly is gold? It’s a hunk of metal. Of course, it’s a shiny, attractive metal, but in reality, it has been a store of value for thousands of years. The “barbarous relic” has historically been a classic flight to quality when fiat assets go belly-up. Right now, we are seeing this phenomenon play out in front of our eyes. It’s now more expensive to buy a bottle of water than a bottle of oil, which could heat your home for a much longer period of time. What’s especially interesting to us is that the price of oil in terms of gold is at historical levels. An ounce of bullion is now worth roughly the same as nearly 40 barrels of Brent crude oil, which is the highest it has been in 30 years. 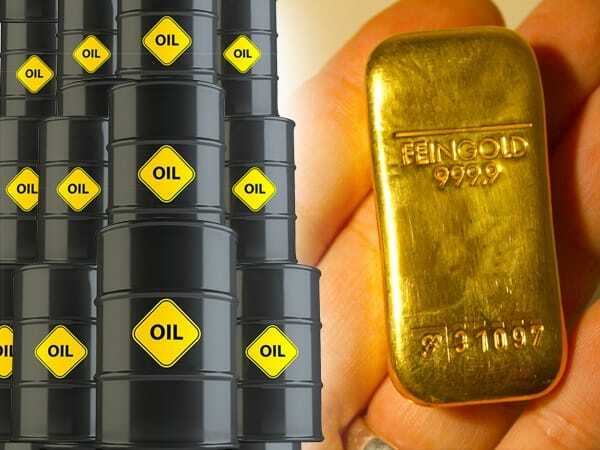 And citing Deutsche Bank data, which goes back 150 years, analyst Jim Reed notes that gold’s price relative to oil is higher than the previous record it has on its books, which was set in 1892. Why is gold gaining so much value relative to oil (and many other commodities)? The simple answer is that, as other commodities collapse due to the global economic slowdown, people are putting their money into an asset that they believe will hold its value. There are many factors that are playing into this scenario of macroeconomic uncertainty. First, the main thing people are worried about is an economic slowdown in China. The communist government in the ‘Middle Kingdom’ has been manipulating growth figures and other economic information for some time now. The problem is that many have gotten wind of what is going on, and they’re not taking it any more. When you combine a slowdown in the world’s biggest economy with the Fed starting to raise short-term rates (which could cripple the American economy), you could get a major market correction. Seriously, the 15% correction in equities that we’ve experienced so far in this country is just the tip of the iceberg. Most developed economies are well into the classic definition of a bear market, with downturns of 20% or more. So with many in the financial community beginning to panic, the value of gold is starting to rise. As oil makes its way down to the $15 level, and as China continues to implode, could we see an even greater “flight to quality” to gold? This train of thought is not rocket science. With gold having come down in price since its highs five years ago, wouldn’t you want to buy something – in a period of massive economic uncertainty – that has not only corrected in price from a much higher level, but which could hold its value (or even increase) in a global equity sell-off? For many Americans, the answer is yes — and it’s partly because of that reason that the price of gold has headed higher these last few months. Could gold prices increase even more? No one can say for sure. But with all the turmoil in the markets and with oil crashing, wouldn’t you want to ensure that your savings are protected from whatever could come? Gold is really getting the most love in 2016. Ready why here.